Albert Whitman & Company, 9780807581452, 304pp. Life in a Nevada mining town in 1905 is not easy for 13-year-old Kit Donovan, who is trying to do right by her deceased mother and become a proper lady. When Kit discovers Papa’s boss at the gold mine is profiting from unsafe working conditions, she realizes being a lady is tougher than it looks. With a man’s hat and a printing press, Kit puts her big mouth and all the life skills she’s learned from reading The Adventures of Huckleberry Finn to work, defying threats of violence and finding that justice doesn’t always look like she imagined it would. Originally a small-town girl herself, Patricia Bailey now lives in a slightly larger town in Oregon with her husband and three cats. 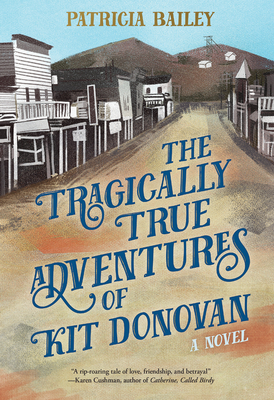 The Tragically True Adventures of Kit Donovan is her debut novel.